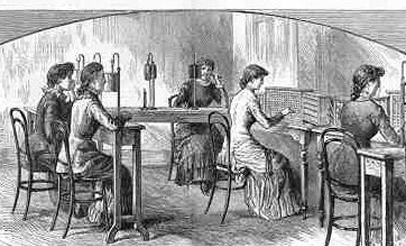 “The Telephone Exchange in London.” Illustrated London News. We are based at the landmark Canada Water Library, at 21 Surrey Quays Road, SE16 7AR. You can find a map showing the library’s location on the Southwark Council website here. We are on the Jubilee Line and the Overground (formerly the East London Line). Canada Water Underground, Overground have an exit that leads directly to the library, and the Bus station is immediately over the road, via a zebra crossing with pedestrian lights. Buses that stop at Canada Water bus station are the 1, 47, 188, 381,C10 and P12. The library has disabled access via lifts, and has a coffee shop for those who arrive early. For full details about the library and accessibility, as well as a photograph of the building, see the dedicated page on Southwark Council’s website. We meet from 11am to 1pm in our autumn and spring terms. You can find out more about us and our meetings on our Join Us page. If you would like to join us or have any questions we would love to hear from you, so please get in touch with our Secretary Frances Bulwer (frances.bulwer@gmail.com).